Late-night bus service that could run until 3 a.m. or 4 a.m. could cost upward of $2 million a year, the MBTA’s board said. After spending its first two years trying to get a grip on service issues and financial trouble at the MBTA, the Baker administration is thinking about expanding the system. On Monday, the T’s board heard two proposals to expand service in Boston and the suburbs. Each idea is modest in scope and cautious in approach and calls for operating a test service that would not require a major investment in new infrastructure. The board may decide in mid-August whether to advance a plan to provide overnight bus service in Boston, and a second one that would essentially extend some trips on the entirely-within-Boston Fairmount Line commuter rail service to Foxborough. Both plans call for a one-year pilot project that would be the first expansions of the Massachusetts Bay Transportation Authority’s system that the board has considered since adopting a policy to concentrate on low-cost experiments that could increase ridership. Yet these new services, State Transportation Secretary Stephanie Pollack warned, “will continue to be a very small part of what we do,” though they could help spark economic development in nearby communities. “If we’re serious about that, we’re going to have to be open to finding opportunities for service while focusing primarily on the core and the state of good repair,” Pollock said. The MBTA has generally been prioritizing modernization and repair work since the crippling winter of 2015 prompted Governor Charlie Baker to call for tighter management. A panel convened by Baker partially blamed the T’s “shortsighted expansion program” for its fiscal and managerial issues. Even so, Pollack noted that the T has continued to advance several long-planned additions, such as South Coast Rail to New Bedford, a Silver Line extension to Chelsea, and the Green Line extension through Somerville — once the administration got a better handle on ballooning costs. 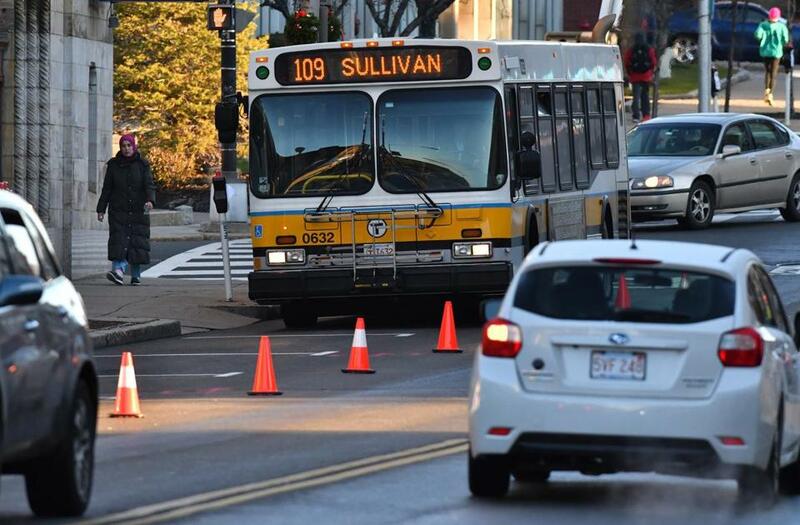 The T has also boosted bus capacity on certain routes and opened new commuter rail stations. The proposal for daily overnight bus service in Boston and nearby municipalities comes 16 months after the T ended a previous version of late-night service, which extended weekend hours on the subway and on some bus routes, in order to cut costs. The new proposal would extend service later in the night and earlier in the morning. The T would increase the number of routes that would start service before 5 a.m. and add 67 buses a week to those routes on which the early runs are already near capacity. Between bus operations, a marketing initiative, and adding a similar service for riders with disabilities, this would cost nearly $1.1 million. The T is considering new late-night routes that could run until 3 a.m. or 4 a.m. That could cost upward of $2 million a year. The T tried to enlist private bus operators for overnight service but got no takers, said Laurel Paget-Seekins, the MBTA’s director of strategic initiatives. Separately, the T is considering another pilot program, for weekday commuter rail service to Gillette Stadium in Foxborough, which currently gets trains only during special events like New England Patriots home games. That would cost about $1.2 million a year, according to the T. Kraft Group, which owns the Patriots and Gillette Stadium, would chip in as much as $217,000. While suburban rail service is supported by town and state officials from Foxborough, as well as by the Krafts, it has drawn considerable opposition from riders of the Fairmount Line, to which eight trips a day would be added to include Foxborough. They worry the new trips to the suburbs would cause delays and disruptions on the Fairmount Line, which is intended to serve more low-income and minority riders in Boston’s Hyde Park, Mattapan, and Dorchester neighborhoods. “Those of you who live in the suburbs, we’re not against you getting public transportation. But you can’t do it on our backs,” Marvin Martin of the Greater Four Corners Action Coalition said at the MBTA board meeting Monday. The T’s oversight board heard testimony from staff and the public on both proposals Monday but did not discuss or vote on either one. It plans to take them up again on Aug. 14. The board also heard complaints from dozens of officials and residents in towns along commuter rail routes about a plan to install hundreds of 75-foot towers to improve wireless Internet service. The MBTA’s acting general manager, Steve Poftak, said he would have more information about the project, which was put on hold for review last month, at the Aug. 14 meeting.